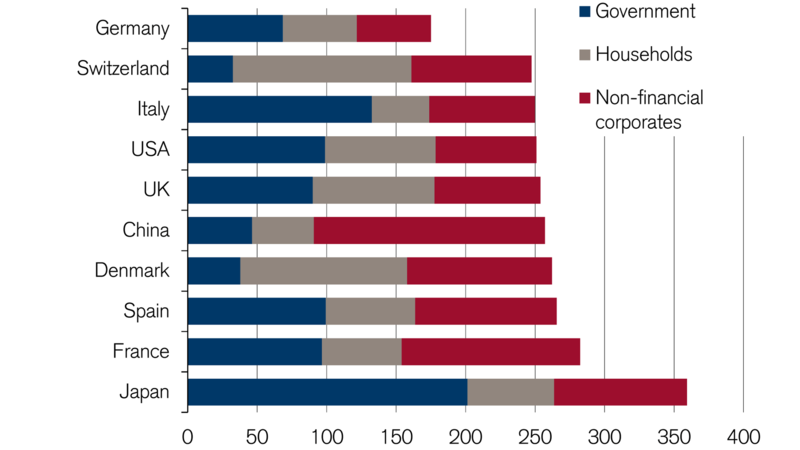 In relation to its economic performance, Switzerland's economy has similar levels of debt to Italy, the US, and China. Mortgage debt is particularly high. Despite the high number of fixed-rate mortgages, rising interest rates should not be underestimated. As a result of the upturn in the global economy, the term structure for interest rates has recently begun to change in Switzerland as well. Although the Swiss National Bank (SNB) is likely to leave the target range for the three-month CHF LIBOR rate in the negative until 2019, longer-term interest rates have increased strongly. Should the global upturn persist and inflation rise, the increase in interest rates would also be likely to continue. 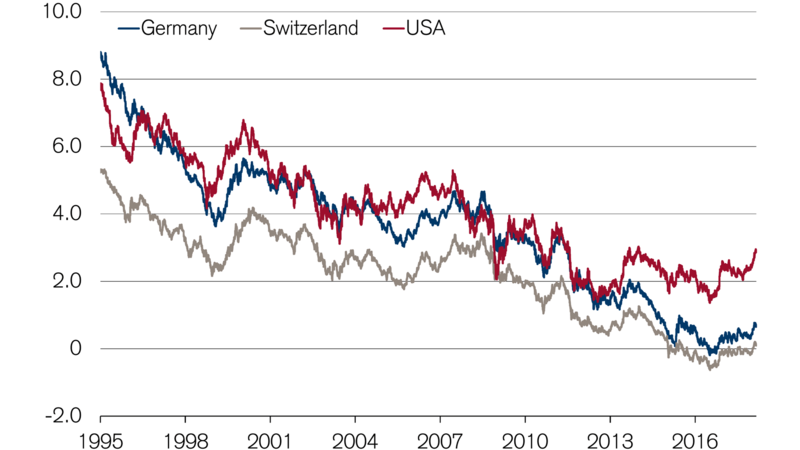 How would higher interest rates affect the Swiss economy and real estate owners? The first and somewhat simplified answer is that higher interest rates are bad for those in debt and good for creditors. Contrary to popular belief, Switzerland's debt level in relation to its economic performance (gross domestic product or GDP) is similar to Italy, the US and China at almost 250 percent. However, the distribution of debt differs greatly to the situation in other countries. 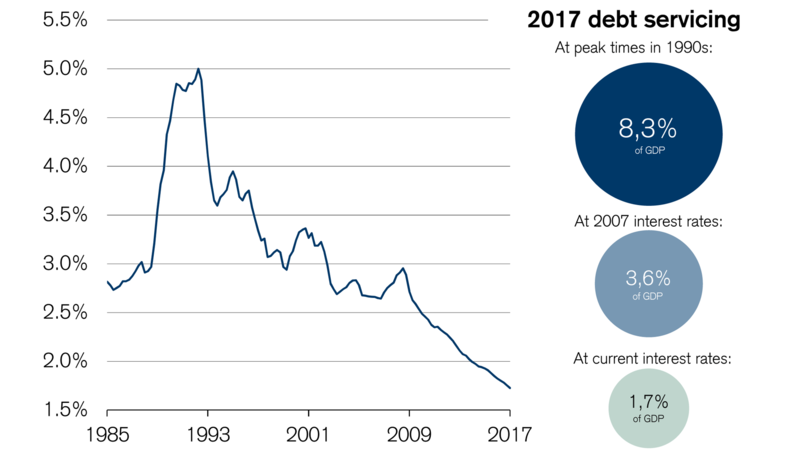 While Switzerland's government debt is lower than almost anywhere else in the world and companies, too, have relatively low debt levels, private debt is at a record high. Mortgages are the main form of debt in Swiss households: A total of 95 percent of all loans are secured by real estate. Over CHF 730 billion in mortgage debt – primarily held at Swiss banks – is currently taken out against real estate with an estimated value of over CHF 1,900 billion. The effects of a change in interest rates could therefore be of major significance to both the real estate market and the local banking sector. Despite the high level of private debt, the proportion of a household's income that is currently spent on interest payments is lower than ever. This is because mortgage interest rates are at a record low – despite their recent increase. The average mortgage interest rate currently stands at around 1.6 percent. To put this in context: If mortgage rates were as high as they were in 2007 (3.3 per cent), homeowner households would have to pay twice as much to service their debts. If interest rates were to reach levels close to the 1990s peak (7.8 per cent), this figure would be as much as five times higher. In concrete terms, this would be CHF 12 billion or CHF 44 billion more each year than current levels. Even a return to 2007 interest rates could place considerable strain on household budgets. However, because fixed-rate mortgages (fixed interest rates over a specific term) make up around 80% of the mortgage volume, it would take a while for homeowners to feel the effects of a change in interest rates. Nevertheless, the risk of interest rate changes should not be taken lightly. After all, real estate is a relatively illiquid asset. Do You Have Any Questions Concerning Mortgages? We will be happy to help. Please call us at +41 844 100 111 or arrange a personal consultation.